Sony didn't bring a new Xperia Z4 flagship phone on the MWC, but it sure make up for it with the Sony Xperia Z4 Tablet. It's the company’s new high-end slate, a successor of the Xperia Z2 Tablet. Sony Xperia Z4 Tablet comes with a 10.1" IPS display of 2560 x 1600 pixels resolution, which results into a nice pixel density of 300ppi. The display is enhanced by Sony's Triluminos technology and X-Reality Mobile engine. The slate is powered by the Qualcomm's latest and greatest Snapdragon 810 chip, which packs an octa-core 64-bit processor with four Cortex-A57 cores clocked at 2.0GHz and four Cortex-A53 working at 1.5GHz. The GPU in charge of graphics is Adreno 430 and there is 3GB of RAM onboard. 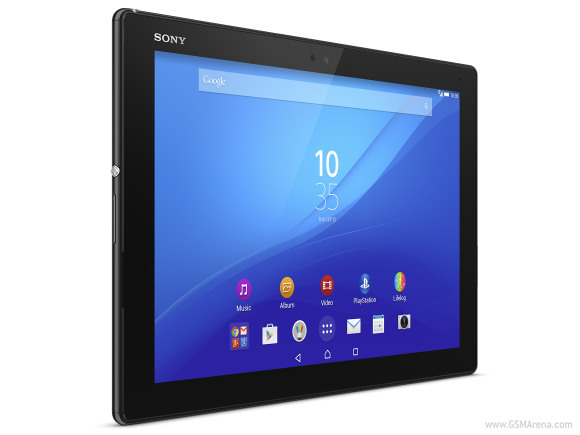 The rest of the Xperia Z4 Tablet specs include 32GB expandable memory, a rear 8MP Sony ExmorRS camera and 5MP wide-angle front selfie snapper, stereo speakers and GSM, 3G and 4G LTE connectivity. The slate is powered by a 6,000 mAh battery and Sony says it will last 17 hours on video playback. 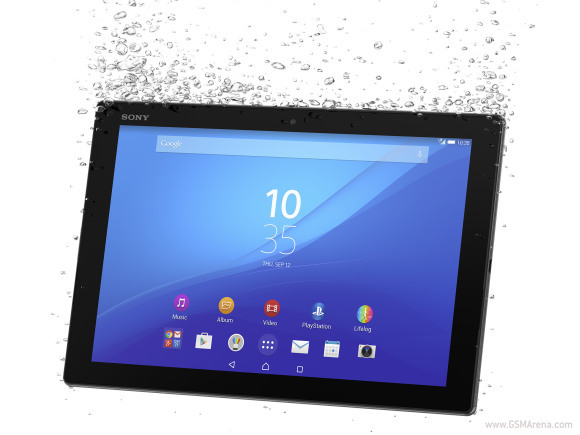 Sony Xperia Z4 Tablet is IP68-certified, which translates in to a dust-tight shell and waterproof design with endurance for up to 30 minutes into 1.5m deep fresh water. The highlights of the Xperia Z4 Tablet include the elegant design with a metal frame, durable glass and amazingly thin 6.1mm profile. Just like with the Xperia M4 Aqua, the Xperia Z4 Tablet comes with a cap-less microUSB port for easier recharging. The tablet weighs about 395 g and will be available in black and white flavors. Sony Xperia Z4 Tablet runs on Android 5.0 Lollipop OS with the latest tablet-optimized Xperia launcher. It will also offer access to Xperia Lounge Gold service, which provides exclusive content such as movies, TV series, music and apps. The slate supports Hi-Res audio playback and digital noise cancelling. The LTE and Wi-Fi models of Sony Xperia Z4 Tablet are going to hit the shelves worldwide in June this year, but the pricing is yet to be announced. Check out our Sony Xperia Z4 Tablet hands-on. Sony has also showcased additional accessories, designed exclusively for the Sony Xperia Z4 Tablet. The first one is the Sony BKB50 Bluetooth Keyboard - it’s an all-in-one detachable accessory with adjustable tilt angle (0-130 degrees), complete with a docking station and a full-blown hardware keyboard with a touchpad. The keyboard dock also comes with projector and printer ports. 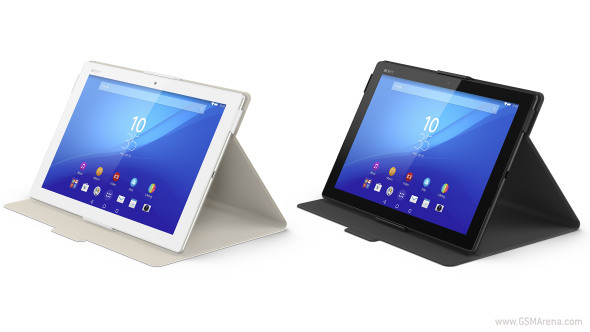 The second accessory - the Sony SRC32 cover is a flip case that doubles as a stand with two fixed positions. It will be available in both black and white flavors. 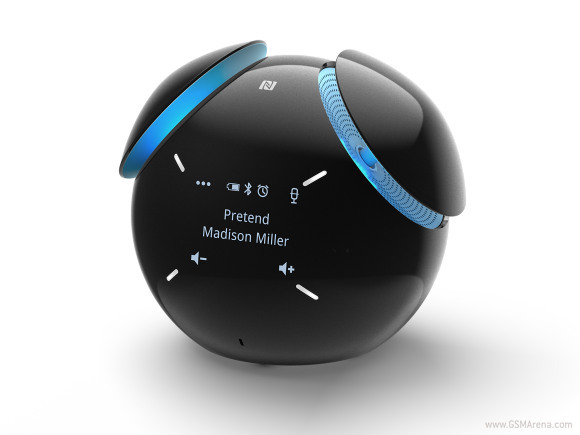 Finally, you can opt for the wireless Sony BSP60 smart speaker, which supports one-touch connectivity. All three accessories will be sold separately, starting June this year. Don't miss our hands-on with the Sony Xperia Z4 Tablet and all these accessories. If this wonder (LTE) able to make voice call, then I say hurrah. I want one.